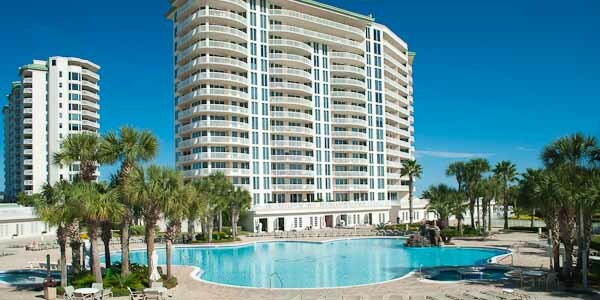 If you have been searching for the best of the best when it comes to luxury resort condos in Destin, then Silver Shells Beach Resort is your destination. This sprawling condominium community sits on the Gulf, with five high-rise towers surrounding the 7,500 square-foot lagoon pool and even lighted tennis courts in the back. The St. Thomas and St. Maarten buildings are direct beachfront, with the pool in the middle. Of the two, only the St. Maarten is used for weekly vacation rentals. This 1999-built tower has units from $750,000 to $1.7 million, and offers two-four bedroom units. The private St. Thomas building, built in 2000, offers two, three, four, and five bedroom units ranging in price from $900,000 to $1.2 million for the largest. The 1999 St Croix building sits behind the pool with direct Gulf views, two, three, and four bedrooms, and is also a rental building. Prices for these are between $600,000 to $700,000. Directly behind the first two towers are the St. Barth and St. Lucia buildings, St Lucia being the rental building and the newest, built in 2005 with two, three, and four bedroom units with a price range of $350,000 to $600,000. St. Barth only allows residential occupation. Built in 2003 and has 16 floors and two, three, and four bedrooms. Prices for St Barth average is $700,000 to $800,000. Behind these two are the tennis facilities. So if you wish to live in this fantastic community, you will look for a condo in St. Thomas or St. Barth. 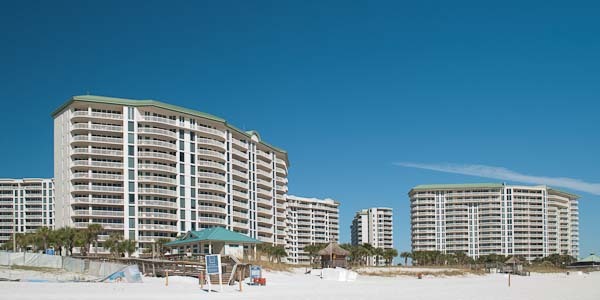 These buildings share the beachfront pool. To use for rental income, choose St. Croix, St. Maarten, or St Lucia. Each of these buildings has indoor/outdoor pools, private parking, hot tubs, and direct beach access. All the towers have penthouses, tiled terraces suround the living rooms, Jacuzzi tubs in master baths, designer furnishings, luxury equipped kitchens and high-speed internet access. An award-winning fitness and cardio center is on-site, as well as a full-service luxury spa. There are fully furnished poolside cabanas available for sale or rental - complete with living areas, refrigerators, TVs, and baths. You can rent Jet skis, kayaks, and other water sports equipment, as well as chairs, umbrellas, beach "beds" and floating cabanas. A beachfront sandwich shop and bar, as well as an on-site five-star Ruth's Chris Steakhouse. For more information or to see any of these exclusive condominiums, call or contact us. St. Barth At Silver Shells Bldg.